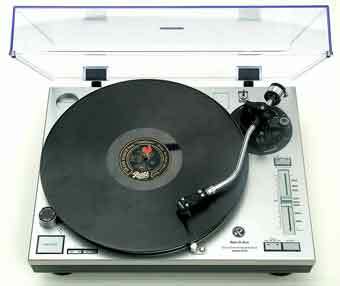 Rek-O-Cut CVS-14 14" Capable Turntable - Tracer Technologies Inc. The 50th Anniversary Edition REK-O-KUT CVS-14 is a fully manual 33/45/78 RPM turntable with a continuously variable and calibrated "78" range of from 62 to 94 rpm. The high-torque, direct-drive motor provides fast start and stop braking. It can play in reverse. A switch is provided which permits playing vertical cut records such as Edison and Pathe records. Supplied with dust cover, slip mat and our 12-speed Super Strobe for speeds from 68.5 to 90 rpm. Not supplied with phono cartridge or styli. These must be purchased separately. The CVS-14 is recommended for both audiophile and vintage records. Dimensions: 17 3/4" X 13 3/4" X 5 7/8"